Now if you are into domain driven design, the chance are you’re going to want to get involved in the meeting. Listen closely to the language used and try to deepen your understanding of the domain. Or at least that’s what you’re supposed to be doing! I hate wasted time in meetings. So I like to get animated, ask questions try and uncover how this new feature will actually help. The problem is, I struggle to take good notes as well. I’ve definitely got better at it but I find I either take good notes OR join in the conversation. Not so good at both. So after a typical meeting I’d grab my measly notes, take a photo of the board and hope I’d remember the rest. Unsurprisingly, I didn’t (well not all of it any way). Why not record the audio of the meeting on my iPhone and take my notes as usual. Combine that with the photo of the board and I’d have all I needed. Smart hey? It kind of works. The big problem is finding the bit in the audio which you need to refer to. It such a pain that I stopped bothering. 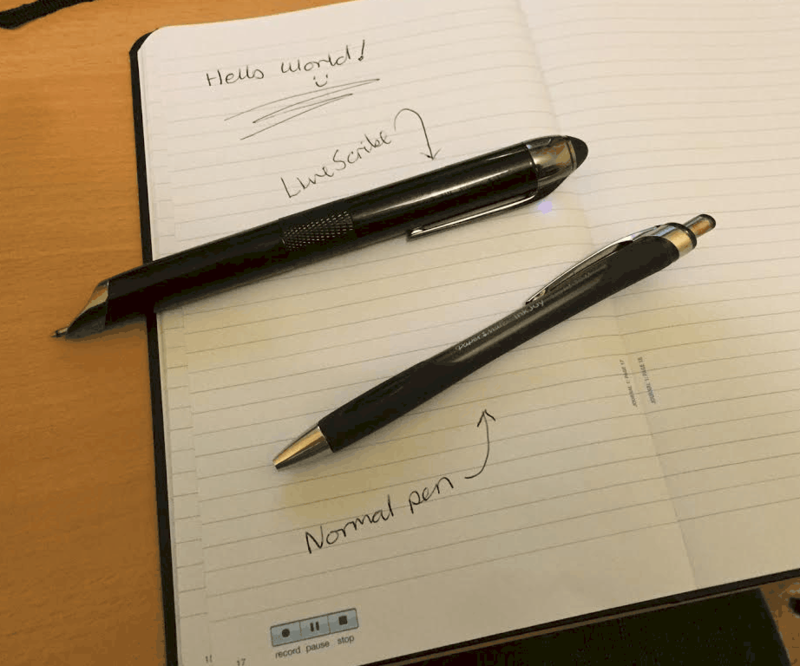 So when I saw the LiveScribe 3* pen I was intrigued. Just like developers world wide, I’m a sucker for shiny tech. But I had resisted the urge to buy the pen – that is until last week. I’m ashamed to say I got myself an early Christmas present. And I love it. I can sit in a meeting with all my usual toys (phone, notepad etc). And I can note things down, nothing revolutionary yet. I can record the audio of the meeting – cool I could do that before. But now the audio is synced with my notes. In effect my notes become bookmarks for the audio of the meeting. I can literally click the notes I made and hear the audio from that moment. This has already been useful and I’ve only had the pen for a few days. It is expensive. It’s not like buying an iWatch for £299 – and that’s at the cheap end!. It costs £149.99 at amazon. And you have to use ‘special’ paper. The main shaft of the pen is a little chunkier than a normal pen, but it is housing some nice tech and battery in the body. For me, I’m comfortable with those ‘drawbacks’. When you turn the body of the pen it jumps into life and connects up with your phone by bluetooth. When you press the record symbol/button on the paper you’re phone starts recording the audio and the pen records what you write. Don’t forget to check everyone is happy with that. It does this by ‘looking’ at the fine print on the paper which tells it where it is on the page. I think that’s a fairly creative solution. 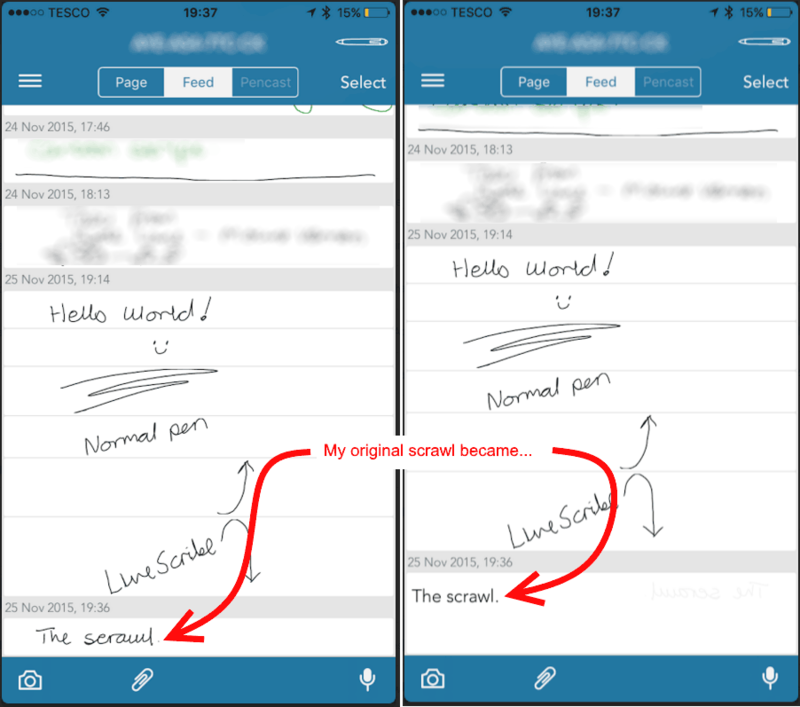 All your writing is recorded in the LiveScribe+ app. The app does the job although it’s nothing to write home about. It works well and has an auto sync with Evernote which is handy. It also has a sync on demand if you don’t want to send all your scawl up into the cloud. Here’s what this note looks like once up in evernote. And it can read your handwriting! Well one line at a time. Here is how it did with my scrawl. I think it’s a great bit of kit and it would make a nice Christmas present. For full disclosure, I was not paid for this review. I did buy this product with my own money. However, the links I’ve put in this review are amazon affiliate links.